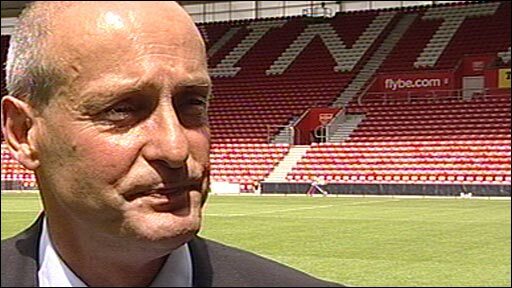 New Southampton boss Jan Poortvliet promises to bring 'total football' to the south coast team. Southampton have appointed ex-Dutch international Jan Poortvliet as a replacement for manager Nigel Pearson. Poortvliet played at the 1978 World Cup and has won six titles as a manager in the Netherlands' lower divisions. The 52-year-old will be aided by fellow countryman Mark Wotte, who will become director of the club's academy. The cash-strapped south coast outfit stressed that the situation has been forced on them by the financial trouble at the club. The salary of the new duo will also be less than that of Pearson but "with big bonuses in an incentivised structure". Poortvliet has been given the title of head coach in a four-man coaching set-up including academy director Wotte, reserve team coach Stewart Henderson and Under-18 coach Dave Hockaday. Pearson, appointed on 18 February, kept Southampton in the Championship after beating Sheffield United on the final day of last season. However, his contract will not be renewed when it expires in June. What do you think of Poortvliet's appointment? Southampton chairman Michael Wilde told the club's website: "Since taking control of the club it has been a major priority to resolve the manager and coaching situation and to that end we had to look at the financial restrictions in which we're operating. "Having established those, we held a meeting with Nigel which was extremely constructive and helpful and helpful. "The board were impressed with what Nigel had to say and we are sure he will be a well respected manager in the future at whatever club he ultimately goes to. "We are extremely grateful for Nigel's contribution. He came to the club in a time of crisis and through his hard work and commitment we were narrowly able to avoid relegation and we wish him well." And Wilde added: "Bearing in mind the financial restrictions, the board have decided to implement a coaching structure which will optimise the potential of youngsters within the club."